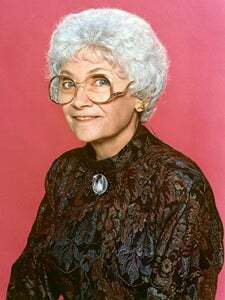 We're assuming that you've heard the sad news that Estelle Getty — best known for her portrayal of sassy Sicilian octogenarian Sophia Petrillo on The Golden Girls — passed away. Looking through the various obits that have since trickled out, we've learned more about Getty beyond the white wig and wicker purse, namely, that she was just as saucy and spry as Sophia. For example: Getty got her start in show business by performing in the Yiddish theater and doing standup in the Catskills at a time when female comedians were a rare sight. She didn't catch her big break until later in life when she began portraying mothers of varying ethnicities in plays, movies, and eventually the small screen. After the jump, a little bit more about the woman who always had a good one-liner up her sleeve and knew how hard it was to be a funny woman in Hollywood. Ms. Getty relished her late-in-life success, her son said. And she enjoyed reminiscing about more difficult times. In a 1990 interview she recalled one of her last secretarial jobs, at a company called Snap-Out Forms, where she kept her acting ambitions a secret for fear of being fired. "At Snap-Out Forms, the first day I came to work, I had an audition, and I said, ‘Can I go for my lunch at 10 o'clock?' " she said. "The next day I had to go someplace else. I said. ‘Can I take my lunch at 2:30?' The next day I asked if I could take lunch at 11 o'clock. The office manager said, ‘You have the strangest eating habits of any secretary we've ever had.' "
Audiences particularly loved the verbal zingers Getty would hurl at the other three. When McClanahan's libidinous character Blanche once complained that her life was an open book, Sophia shot back, "Your life's an open blouse." Getty, a natural comedian famous for her one-liners even in private life, played Sophia for laughs, but she also brought depth to the character. It was her idea that Sophia would always carry a purse because, she said, older women are forced to shed so many possessions in their later years that everything they own ends up in their purses. "Nobody puts down their life very easily," she explained in a 1992 interview with Newsday. She requested that Fierstein write a part for her, which he did in "Torch Song Trilogy." The middle-aged Getty improbably became the toast of the town and was spotted by the "Golden Girls" producers who asked her to audition. Arriving in character — an oversized thrift shop polyester dress — she landed the part. She was a vocal supporter of gay rights and active in fundraising for AIDS research. She retired in 2000 after revealing she was suffering from Parkinson's disease. Two years later, she announced she was suffering from Alzheimer's disease. In a 1995 interview, the tiny Gettty — she was under five feet tall — admitted that many of her biggest fans were children. "I think they look upon me as an old child, because I'm so little," she said. Born Estelle Scher in New York City in 1923, Getty wanted to be an entertainer from an early age, despite her small size and the initial objections of her Polish immigrant parents. She got her start as a comic at resorts in New York state's Catskill mountains and pursued her dream as an actress in regional theater and off-Broadway productions while raising two sons and working office jobs to make ends meet. Born Estelle Scher in New York City on July 25, 1923, Getty started out her career in the Yiddish theater, but her focus soon shifted to settling down and raising a family with Arthur Gettleman, whom she married in 1946. They remained together until Arthur's death in 2004.